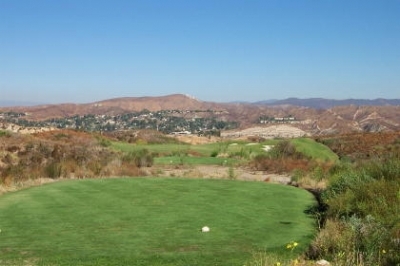 SANTA CLARITA, CA -- These days, most new golf facilities go out of their way to preserve the environment; not always by choice. Strict federal, state and local regulations often make it very difficult to take just any plot of land, put up some buildings, move some dirt and open for business. If you add archeological sites, endangered species and rare plant life to the mix, the ordeal can become darn near impossible -- and time consuming at the very least. The par three 12th hole on the Mountain Course. A bit of a forced carry over a natural area, and a sloped green make this a tougher test than it appears. The process starts well before the first earth is moved. It's more like scout for land, make a trip to the county assessor, consult an engineer, apply for permits, then tread lightly if you've got any flora or fauna that might come under the 'protected' mantra. It's a virtual maze of red tape that must be meticulously navigated in order to build a project. And with the shrinking pool of pristine developable land (at least near major population centers), the problem only becomes more acute. It's gotten to the point where many folks think preserving the environment is a pain. Not at Robinson Ranch. Course Architect Ted Robinson has been working on golf courses since he was five years old (well, he helped pick up rocks on his father's two hole course in Antelope Valley), and he's been all over the world leaving his signature on some of the game's famous courses (including Sahalee, which hosted the 1998 PGA Championship). Along the way, he's garnered a reputation for environmental care and minimal usage of natural resources in his work. Looking from in back of the Valley Course's 9th green. It's the epitome of a risk-reward par five, where accuracy and length can both be used to your advantage. 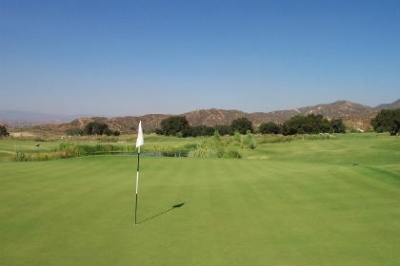 Robinson Ranch is a 36-hole facility north of Los Angeles -- and is owned by none other than Ted and his son Ted Jr. The father and son team combined several tracts of land to formulate this 400 acre facility, of which only 180 acres have been seeded in turf, leaving the balance for nature and a fraction for home sites (about 50 acres). Robinson says it's his best work yet, and that's not just because he's the proprietor. John Pollok, Robinson Ranch's Head Agronomist and Project Manager, says he's been there from the start of construction -- and the Robinsons took particularly good care of the property: "The Robinsons began the process in 1994, obtaining the various permits from the governing bodies, all the while making sure everything was done properly to preserve the natural surroundings. They'd originally only intended to put one course here, but then decided the land was suitable for a second course sometime after." Pollok continues, "There was a conscious decision to keep the number of home sites down, as well as limit the area covered with turf grass. The balance was landscaped in the native plants to the area, such as the Chaparrals, Sages, California Sycamores and Coastal Live Oaks. The property also butts up against the Angeles Crest National Forest on one side, so the Robinsons wanted continuity with the surrounding environment. That's not only good for our aesthetic enjoyment, it also provides habitat for wildlife (Robinson Ranch is an Audubon Cooperative Sanctuary). These things just enhance the golf played here." Like many holes on the Mountain Course, the short par four 11th hole won't call for a driver -- but you'd better be able to hit your target in the fairway. Sure enough, with a cursory look over the landscape, you'll see plenty of vegetation, very few homes, and what appears to be a generous amount of turf -- but that's just the view from the clubhouse. Once you travel back into the canyon areas, there's quite a lot of nature all around. Another good thing about keeping the area 'natural,' was the intended side effect of saving water. Anyone familiar with Southern California knows that conserving water is often not a matter of choice, it's mandatory. Pollok says that's one of the reasons they won't overseed the rough areas in the winter months, because rye grass takes an intolerable amount of H2O. In addition to safeguarding the property's collar areas, Pollok says there was a very special effort made to preserve the specimen Oak found at Robinson Ranch: "The thing most people remember about this facility after they leave is the large number of oak trees that not only dot the property, but help to define the golf courses. We had the ability to impact about 160 oak trees throughout the facility, but chose to impact only 100. They were simply too beautiful to deal with carelessly, and now we're very glad we took the care we did with them." Finishing up on the Valley Course's 18th hole -- you've just completed one of the toughest stretches of holes you'll ever play. "Of the 100 we did impact, we transplanted 45 of them. That involved digging them up, moving, then replanting them in another location, which may not sound like much, but those trees aren't exactly saplings out there. It was quite a process," Pollok said. Doing the math, only 55 trees out of 400 acres were completely removed. Not a bad ratio. Especially notable, perhaps, are the trees that were left in place. 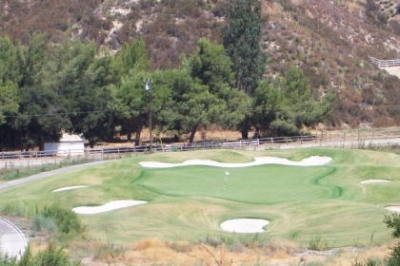 The back nine of the Valley course (and front nine of the Mountain course) has numerous full-grown oaks, which give it an extremely mature look for a course so new. Further, most courses with trees weave the landing areas around them, or occasionally frame an area to give it definition. At Robinson Ranch, the trees sometimes are the landing area. Take the view from the ninth tee. Pollok describes it: "The trees add some controversy to the design, but once you've played the courses enough times, I think most people appreciate the placement. A good example is number nine (on the Valley), a demanding 549-yard par five, with a large oak tree lying smack in the middle of the driving area. Depending on the wind, you may try and clear the tree, but then the landing area narrows considerably in the yards past it." 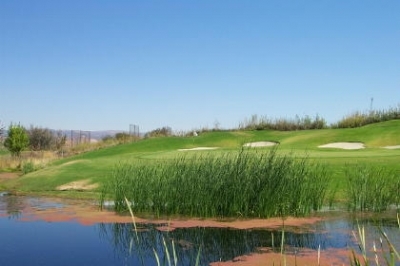 At 484 yards, the Mountain Course's finishing par five will offer an eagle chance -- but your second shot will have to carry this pond to take advantage of it. "In this sense, the trees function as strategic elements, just as you'd use ponds or sand. It definitely demands some thought when pulling clubs for tee shots -- and can even benefit the players, because you won't always have to hit driver. Nine's a terrific risk-reward type hole that you won't see at very many other courses," Pollok added. That's true. And a similar type of dilemma greets you on number fifteen, where another large tree impacts the landing area. It can make this medium length 414-yard par four play much longer if your path's blocked -- which could even be in the middle of the fairway. One of Pollok's favorite holes is number eleven on the Valley course, not because it's a beastly long and difficult par three (it's not), but because of the way the oak trees surround the green. "There really isn't a bad hole on the back nine, but I'd say one of my personal favorites is number eleven. 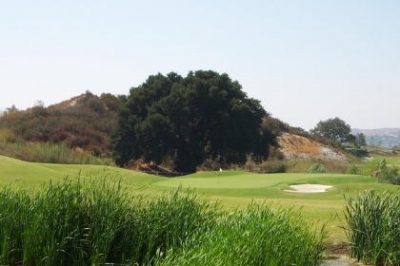 The oak trees provide a beautiful contrast with light and shadow, which can sometimes play havoc with your putting game, but will never let you down because it's so picturesque." The Valley Course's 16th hole -- a double target -- narrow landing area off the tee, and trouble surrounding the green on the approach. You'll get a similar feeling on number five of the Mountain course. If your drive isn't place properly in the fairway, you'll be figuring on how to maneuver around the oak trees guarding the entire putting surface. One special note, although there was considerable attention given to the natural gifts of the property, the playing surfaces were not overlooked. The fairways are a hybrid Bermuda that's lush and green, especially in the hottest parts of summer. And the greens -- with A4 bentgrass, are simply some of the best surfaces you'll ever see. Period. Pollok's in charge of maintaining them, and states with pride: "Tom Lehman came here with Duffy Waldorf (who lives nearby), and he said the greens were the best he'd putted on all year, and he played in all four majors. I'd give our greens a 10+ for conditioning." The Valley Course's 205 yard, par three 7th hole will play shorter than the yardage. It's all downhill, and quite a view. All bentgrass surfaces provide a smooth and even path, but A4 may be the best of them all. It demands to be cut short, because there are more blades of grass per square inch than any other type. 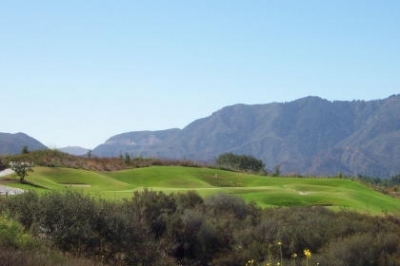 A4 is somewhat delicate, but Robinson Ranch's large greens will provide for many pin positions. And under Pollok's loving care, there's little doubt the greens will hold up. To conclude, some people think preserving the environment is a necessary evil -- and will sometimes even seek out loopholes to avoid difficult problems. 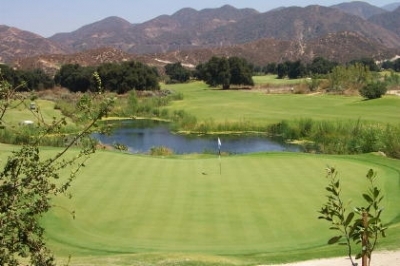 But if you're looking for a place where the loopholes weren't part of the game plan, try Robinson Ranch, where nature takes its course(s). Course Designers: Ted Robinson Sr.; Ted Robinson Jr. Range from $87-$132. Reservations can be made up to 60 days in advance. Twilight rates: $59 weekdays, $69 Fri-Sun and holidays. Senior and Junior rates available.